A record number of applicants have been narrowed down to a shortlist of seven for the prestigious agribusiness badge of honour, the Zanda McDonald Award. The trans-Tasman award, now in its fourth year, recognises agriculture’s most innovative young professionals. The four New Zealand and three Australian finalists for the 2018 award were selected for their strong leadership skills, passion for agriculture, and their vision and inspiration for the primary industry. The Kiwi finalists are Thomas MacDonald, 24, Business Manager of Spring Sheep Milk Company in Waikato and Sir Don Llewellyn scholar, Lisa Kendall, 25, owner/operator of Nuture Farming Ltd and vice-chair of the Franklin Young Farmers Club, Ashley Waterworth 34, who manages and co-owns the family sheep and beef farm in Waikato, and Hamish Clarke, 27, third generation farm manager in the Northern King Country. . . The country’s biggest sheep meat processor Alliance is calling for more merino farmer suppliers for its Silere brand, as Asian demand for the meat grows. Alliance took over the brand Silere from New Zealand Merino and Silver Fern Farms last year, when it wanted to expand its portfolio of premium products. Silere Merino’s season is very short and more lambs are needed to meet the strong demand, Alliance marketing manager for premium products Wayne Cameron said. Processing here started at the end of September and goes through until Christmas, which is winter in Asia and when consumers prefer to eat lamb. . .
On a bend in the Clarence River, tucked between the Inland and Seaward Kaikoura ranges under the distant towers of Mt Tapuaenuku is New Zealand’s most remote high country station. Muzzle Station is only accessible by 40 kilometres of rugged, muddy 4WD track that connects it to the Inland Kaikoura road. The track crosses the Clarence and a 1300 metre pass on the Seaward Range. Deep snow makes it impassible in winter. It takes about three hours to get from Muzzle to Kaikoura and that’s on a good day when the river is fordable and the pass ice-free. . .
Foreign investment in forestry is crucial and New Zealand could never afford to buy back all the forests it has sold, the Forest Owners Association says. New Zealand First leader Winston Peters said the future of forestry and timber supplies for local mills is one of his party’s priorities as it heads into coalition talks. He wanted the next government to protect wood supply to domestic mills by creating a Forest Service, and had previously stuck-up for Northland wood processors who said they were being squeezed out of the market by foreign forest owners and buyers. Commercial forestry is a much bigger industry than most people think, with $25 billion to $30bn invested in plantations, the association’s president Peter Clark said. . . The Hawkes Bay apple industry is negotiating with Napier’s port over two proposed levies the sector says could cost it millions of dollars. The first levy is to cover an extra $2 million in insurance premiums, which have risen because of quake damage in Lyttelton and Wellington. The second is aimed at the pipfruit sector during peak season. The port is proposing a fee of $100 per 20,000-foot refrigerated container, starting in February. . .
Drone-mounted lasers could be used to zap weeds that are posing a billion-dollar problem for New Zealand agriculture, AgResearch scientists say. AgResearch – with partners the Universities of Auckland and Michigan and NZ-based technology firm Redfern Solutions Limited – has been awarded just under $1 million from the Ministry of Business Innovation and Employment’s Endeavour Fund to look into how to “map and zap” the many weeds plaguing productive land. A recent study led by AgResearch concluded from available research that the known costs of weeds to New Zealand agriculture was at least $1.685 billion a year, but that the true cost from all weeds was likely to be much higher. Environmentally friendly tools are being urgently sought for the early control of these weeds. . . Farmers are being urged to check sheds and chemical stores for DDT or other banned pesticides as The Great DDT Muster does a final sweep of the country. Funding for this free collection and disposal service for persistent organic pesticides (POPs) is coming to an end but the company responsible for the service, 3R Group Ltd, believes there is still more out there. 3R’s ChemCollect manager, Jason Richards, says they’ve been running rural chemical collections for a number of years but knew that farmers weren’t having DDT and other POPs picked up simply because it was too expensive. . . The man behind a proposal designed to deter people from cattle rustling says he hopes the final law goes further to include other rural crimes. Rangitikei MP Ian McKelvie had his member’s bill proposing the law change pulled from the Parliamentary ballot recently. The Sentencing (Livestock Rustling) Amendment Bill proposes making stock theft an aggravating feature when thieves are sentenced in court. McKelvie said stock rustling was a big issue for farmers, especially those in remote areas of the country. . .
A big drop in the number of deer being processed has undoubtedly played a big part in the strength of venison prices to farmers, but there are other important factors at work. “We are reaping the rewards of 35 years of market investment,” said Duncan New Zealand’s Glenn Tyrrell. They’re right but there are also other factors at play. Whether it’s the emergence of paleo diets or culinary trends – like small plates and shared plates – or the new enthusiasm in Europe for summer barbecues, our farm-raised venison looks like the right product for the times. . . . The just released Primary Sector Science Roadmap features a pine tree nursery on its front cover. The Forest Owners Association says this is a clear signal that the primary sector is not just a food sector. The FOA president, Peter Clark, says size and importance of the forest sector for New Zealand, as at least the third most significant export category, is often ignored. . .
A new high-level plan to guide Waikato Regional Council’s work to promote a healthy catchment in the crucial Lake Taupō zone has been approved by the integrated catchment management committee today. The Lake Taupō catchment, covering nearly a tenth of the Waikato region, contains the country’s largest lake and 11 smaller lakes, as well as significant hydroelectricity schemes and geothermal resources, and is home to major tourist attractions. . . .
India Trade Alliance was once again on the forefront of cementing Agriculture business and government relations between the state of Haryana, India and New Zealand. India Trade Alliance worked closely with the Government of Haryana, India in promoting #NZ Agricultural capabilities and best practices. As a result the Haryana Agricultural Minister Hon O. P. Dhankar led a 16 member strong delegation that included senior MLA’S and CEO’S of various Haryana Agricultural a departments. . . There is something for everyone at the event of the year for New Zealand’s apiculture industry. The Apiculture New Zealand National Conference will be held at the Rotorua Energy Events Centre from 9 July to 11 July 2017, gathering hobbyist and commercial beekeepers, honey packers and anyone with an interest in apiculture from around the country and abroad. 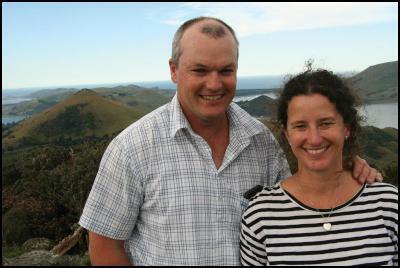 . .
Portobello sheep and beef farmers Brendon and Paula Cross have been named Supreme winners of the 2016 Otago Ballance Farm Environment Awards. At a Ballance Farm Environment Awards (BFEA) ceremony on April 15 (2016), the couple also collected the Otago Regional Council Quality Water Management Award, the Beef + Lamb New Zealand Livestock Award and the Farm Stewardship Award in partnership with QEII National Trust and the New Zealand Farm Environment Trust. . .
Three finalists for the prestigious Dairy Woman of the Year have been announced by the Dairy Women’s Network. They are Westport based Landcorp business manager Rebecca Keoghan, Central West Coast dairy farmer Renee Rooney and Waihi based LIC farm solution manager Michelle Wilson. Dairy Women’s Network chief executive Zelda de Villiers said judges had a hard time selecting the finalists for the fifth annual awards. “Our nominees personify all that is good about the many and varied roles women play in the dairy sector up and down the country,” de Villiers said. . . . I had the opportunity to attend “A Good Yarn” – a workshop run by the Southland Rural Support Trust. We delved into the topic of farmer’s mental health. Financial pressures and on farm conditions both have been converging to ramp up the stress in our southern farming communities of late. As I sat and listened, I started to realise that I ticked a few of these boxes. For example stress can manifest itself in losing one’s temper at the most minor on farm “hiccups” . I just thought that was normal. . . I have been a farmer for more than 40 years and I have grown genetically enhanced (GE) crops since 1996. We grow corn, soybeans and canola, all of which are GE, as well as other crops that are not GE. I have seen many benefits to this technology through the years, but what is in it for the consumer? Safe, affordable food that’s better for the environment. I really don’t consider the crops I grow to be ready-to-eat food, like apples, carrots or potatoes, but more like ingredients to make food products such as margarine, flour and feed for livestock. Government regulators and scientists wanted to be sure of the safety of GE crops right from the beginning. As a result, these crops have undergone testing far beyond that required for other new crop varieties. There have been about 2,000 published studies on GE crop safety. The results say that the GE crops grown today are as safe as any others. Some reports say they’re even safer. There have also been several studies that show how they reduce food prices, too — a direct result of higher farm yields. GE crops are one reason why North American consumers have the safest, highest quality and most affordable food in the world. . . Rural Contractors NZ (RCNZ) president Steve Levet says comments made by Deputy Prime Minister Bill English in relation to the suitability and work ethic of some young New Zealanders is, unfortunately, correct. Mr Levet was commenting on Mr English’s recent remarks to a Federated Farmers meeting, saying there’s a proportion of the work force that won’t work and are “pretty damn hopeless”. “Bill English is right when he says that some younger New Zealanders, when offered the chance for work, won’t take it, can’t pass drug tests, or don’t have an appropriate drivers licence. . .
Two companies with histories dating back more than 120 years could soon be partnering in an international merino wool deal. Armidale Merino Stud, based in Otago, has been in the Paterson family since 1880 and Simon Paterson is the fifth generation to run the farm. Devold of Norway, a company founded in 1853, is looking to partner with the stud to use its merino wool. . . When Logan Wallace first joined Young Farmers, one of his goals was to reach the grand final of the FMG Young Farmer of the Year Contest. Eight years later, his dream has been realised following his recent victory in the Otago-Southland regional final in Wyndham. A member of Clinton-South Otago Young Farmers Club, Mr Wallace (26) will now line up against the six other regional final winners in the grand final in Timaru in July. . .
It’s nearly time for the New Zealand Century Farm and Station Awards. The function for the latest awards will be held in Lawrence next month, with 34 families being formally recognised for farming on their land for 100 or more years. Chairman Symon Howard was delighted with this year’s result, saying it was great to see that, after 11 years, high numbers of new applications were still consistently being received. . .
Peter Clark, the chief executive officer of PF Olsen Ltd, has been elected president of the Forest Owners Association (FOA). He replaces retiring president Paul Nicholls. George Asher, chief executive officer of the Lake Taupo Forest Trust, has been elected vice-president. The association’s members own the majority of New Zealand’s plantation forests. It works closely with the Farm Forestry Association and is administrator for the Forest Levy Trust Board, which represents the interests of all forest owners. . .
Forest owners say the formal adoption of the Paris climate change agreement in New York Friday [22 April] will potentially have great benefits for both plantation and natural forests world-wide. Climate change minister Paula Bennett will be in New York to sign the agreement along with representatives from 130 other countries. Forest Owners Association president Peter Clark says getting signatures on the agreement is yet another step in a long journey. The agreement will come into force once it has been ratified by 55 countries – representing at least 55 per cent of global emissions. . .
Ngāi Tahu Seafood officially opened a new purpose-built facility in Bluff today – 15 April. This new facility represents a significant investment in the local community and wider Southland district and it is expected to provide new employment opportunities. Ngai Tahu Seafood Ltd has operated in Bluff since 1992 in a number of used facilities (three in total). In 2013 the decision was made to build a new purpose-built facility which would be future proofed to enable for expansion for all species and formats such as live fish, crustaceans and shellfish and / or fresh chilled and frozen products. . .